This Sunday, November 17, kicks off the two-night premiere of Fox’s new futuristic series, “Almost Human.” If you were wondering if you wanted to add another show to your watch-list, Fox just released a nice and extended movie-style trailer. They've also released the first seven minutes of the first episode, so we've provided that as well. Set in the year 2048, the show pairs humans with androids and is executive produced by J.J. Abrams and J.H. Wyman. Wyman served as showrunner for “Fringe” so we’re curious to see if “Fringe” fans follow. "Almost Human" – Executive-produced by Emmy Award winner J.J. Abrams (“Fringe,” “Lost,” the “Star Trek” and “Mission: Impossible” franchises) and creator J.H. 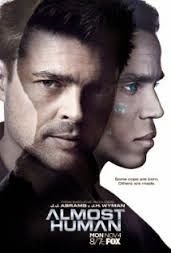 Wyman (“Fringe,” “The Mexican”) and starring Karl Urban (“Star Trek”), Michael Ealy (“Sleeper Cell,” “Common Law”) and Emmy Award nominee Lili Taylor (“Six Feet Under,”"The Conjuring"), "Almost Human" is a high-tech, high-stakes action drama set 35 years in the future, when police officers are partnered with highly evolved human-like androids. An unlikely partnership is forged when a part-machine cop (Urban) is forced to pair with a part-human robot (Ealy) as they fight crime and investigate a deeper cover-up in a futuristic new world. Abrams recently sat down with Entertainment Weekly to discuss his new series. You could click on the link to read the full interview, but here's a taste about what he thinks viewers will be excited about. EW: With "Almost Human," what sort of stories are we going to see this season that our readers would be excited about? Abrams: One of the opportunities about this show is it not only has characters that make you smile and laugh, and relationships that feel as unique as they are familiar, but its uniqueness comes from something that isn’t necessarily possible right now. Like any story-out-of-time, you want characters and situations where you go, “I know what that is. I know what that feels like. I know someone like that” — even though the person might be a different species. In this show, not only are the relationships unique, but the situations the characters find themselves in are equally unique. The paradigm is familiar, but the specifics are different. If there’s a new weapon on the streets, it won’t look like a weapon you’re familiar with, but you can understand it’s a dangerous thing that shouldn’t be in the wrong hands. It might be a bullet that doesn’t shoot the way you expect. It might be a drug that does something to you that’s insane and horrific. It might be something about harvesting organs that isn’t like anything in present day. The technology is part of what’s going on, but there’s a level of relatability and understanding. Will you be tuning in? The show airs this Sunday and Monday at 8 p.m. ET.